All it takes to tease is a good brush and some hairspray! Teasing (or backcombing) is an awesome way to create texture and build volume for everyday styles or updos. The Remington Teasing Brush features a pointed end that helps with parting and sectioning hair during styling. This is one tool that can do it all! 1. Section the hair around the crown of your head using the sectioning end of the teasing brush. 2. Starting with a 2” section, lightly hairspray focusing on the area you will be teasing. 3. 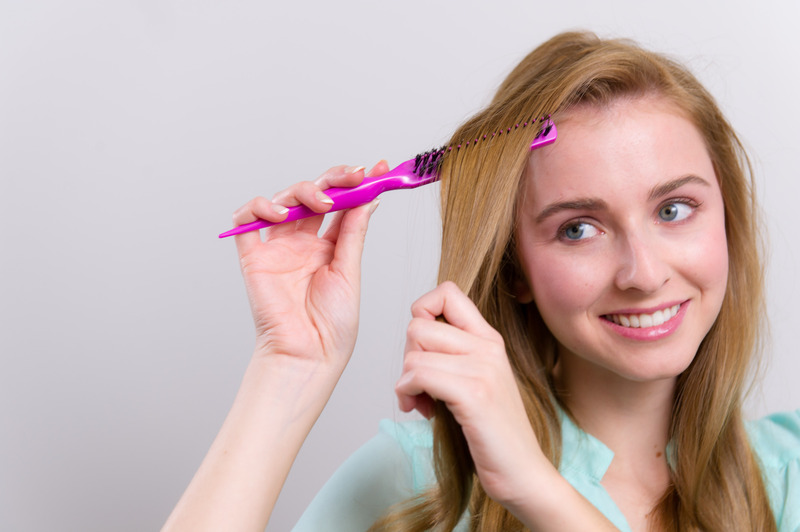 Using the teasing brush, gently backcomb the hair while holding the section straight up. You should start about 3-5” above the scalp, depending on your hair length. Then brush the hair down towards your scalp several times until you reach your desired volume. Tip: To avoid breaking your hair, don’t be too aggressive when backcombing and don’t brush hair quickly. 4. Repeat steps 2-3 on all hair sections around the crown of your head. 5. Once all sections are teased, part your hair as usual and lightly brush top layer of hair, making sure to not flatten out the teased hair underneath. Tip: To have a smooth finish without brushing, keep a thin layer of hair around your part separate during teasing. Then when you are done teasing, let that section down to be a smooth layer over the teased hair. 6. Scrunch your hair at the roots with your fingers for additional volume and look for any areas that may need additional teasing. 7. Smooth down your hair again using your hands and a shine serum or hairspray. Now your teasing is complete and it’s on to the styling. 8. Leave your hair down for natural big hair or bring hair up into a bun or ponytail. Anyone who’s had a bad hair day (who hasn’t?!) knows the value of owning a good brush. But one brush does not fit all styling needs. Remington has you covered on everything from building volume to drying hair faster. 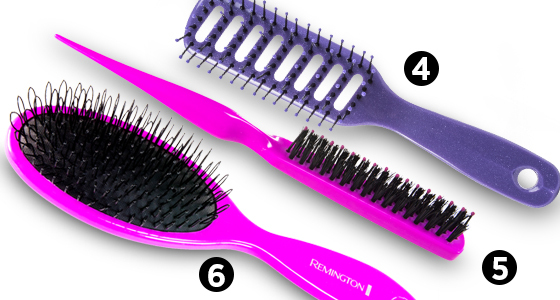 Check out the guide below and find the perfect brush for you! The ideal set for the man in your life. The cushion brush smooths out short or long hair and the comb works best for detail styling any difficult areas. 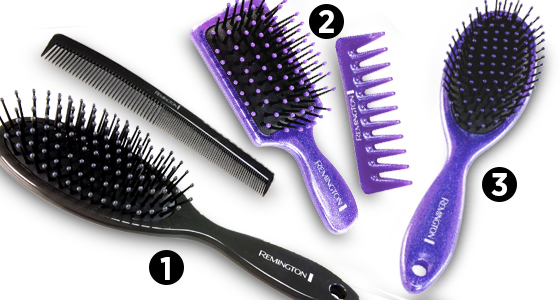 This brush and comb are the perfect size to keep in your purse for on-the-go styling. You’ll be prepared for any windy day. The cushion brush is essential for medium to long hair. The nylon bristles detangle and smooth out hair and are also great for scalp stimulation. The ends of regular brush bristles can snag and pull on wigs, extensions and weaves. This brush has looped bristles, so you can smooth and detangle your hair with no worries! This brush is sure to pump up the volume. It was specially designed for backcombing, teasing, and finishing, hair. It also has a special handle for sectioning hair or creating the perfect part. With a vented base, this brush can actually save you time getting ready. It was designed for use with a blow dryer, speeding up drying times and providing maximum volume. I’m Tiffany Lee, a celebrity hairstylist and makeup artist, taking a moment as a Remington Ready Guest Blogger! On my channel, you will find anything beauty related such as makeup tutorials, hair tutorials, swatches and reviews, and fashion related videos! 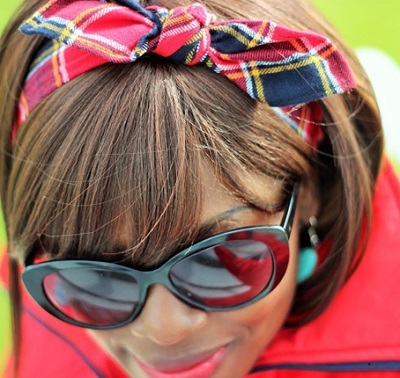 Today, I’m sharing the how to create a Romantic Loose Updo using the Simply Wrap n Go Curling Wand.